Frank Buglioni is set to face friend and rival, Callum Johnson on March 24 at the O2 Arena (Millennium Dome), Greenwich. 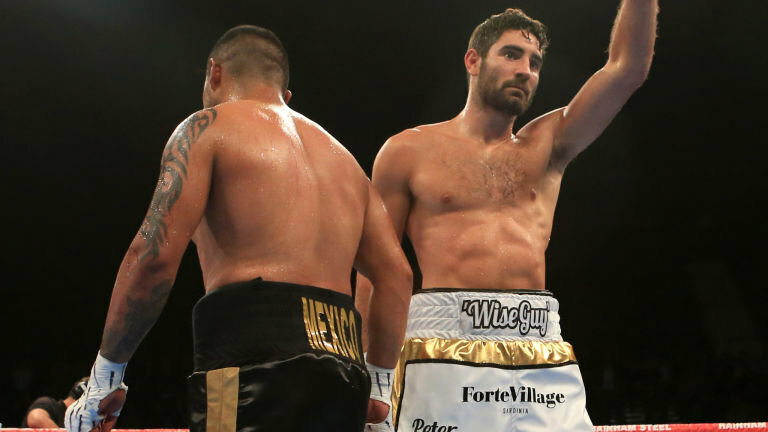 Buglioni is the current British champion and his record current stands at 21 wins, 15 KO’s, two defeats and one draw. Callum Johnson began his career in 2016 and has had 16 fights. His career hasn’t been as active as he’d of liked but he remains undefeated and Buglioni should shape Johnson’s future career should he win or lose the fight. “With just his experience, Buglioni wins. Callum Johnson is a better talent than him but he’s taken a long time to show what he can do. I don’t know if that’s been because or injury’s or whatever, whether it’s been his fault or not. But he should been either here and failed or here and moved on by now at this level, and he hasn’t and that’s a worry. I don’t know if its lack of ambition or he’s just been injured or just bad luck – He should of moved on from here by now. “Buglioni will think he is better than he is or better than he should be and he’ll think he can go beyond this level. I think the way Buglioni fights, he’s so easy to hit. Buglioni he’s tough and he can bang and he’s a real tough kid and he’s a good looking kid. But look, you don’t rely on how tough he really is and because he is really easy to hit I’m surprised he’s done so well, I got to be honest . He has done well and proven to be a real good British level champion. “I think that experience and the hard fights he’s had. Even the fight against Fedor Chudinov for the world title, when he wasn’t ready, he was so brave and tough and too brave – his corner were too brave for him as well in that match. But all those things had him in good stead and I think he’ll win the fight. He might get the stoppage – it all depends on the ambition of Callum Johnson and that’s where I worry about Callum Johnson. The fight between Frank Buglioni and Anthony Yarde has been talked about for some time now. Although the fight hasn’t happened, it has left fight fans eagerly awaiting to see if it will happen this year. “I think at the moment you have to put Buglioni favourite – He’s boxed live opposition. I should be favouring Yarde, as he’s on the channel [BoxNation] that I work for. “Yarde probably has more natural ability than Buglioni, he certainly looks prettier and he looks like he hits harder and he looks more stylish of the two. But he hasn’t had those chin checks. Frank has. He’s been hurt and had to overcome it, he’s faced defeat and bounced back from that. “I think at the minute you’d have to favour Buglioni. The same thing with Callum Johnson, that sheer experience that he’s had. If the fight was made today, I’m not saying Yarde can’t win, Yarde has done nothing wrong and looked exceptionally good doing so and maybe he is too good for everyone. It’s horrible because you want to see a fighter get hurt to see how he reacts. You want to see a fighter not be able to hurt someone and see how he reacts and then you can confidently judge how far you think they’re going to go. “But at the minute Yarde could be the best thing that’s ever put on a pair of gloves or he could be a total fabrication who’s been well matched. You just don’t know until he’s in a test, if that test can stand up, feel his power, he hits hard, he’s very measured, he doesn’t rush his work, he works hard -he ticks all the right boxes for where he is in his career right now.